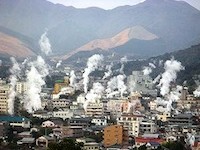 Beppu Onsen is a group of hot springs in the city of Beppu, Ōita Prefecture on Kyushu island (Japan’s South). It is known for the richness of its resources (there are 2,909 hot spring vents within the city), which is the second largest amount of hot spring water discharge in the world, and the largest in Japan. Its eight main onsens are also called the “hells of Beppu” and are popular tourist destinations, not only for bathing but also for viewing. 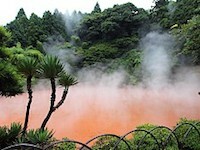 There are boiling ponds and all kinds of wonders, and even a pond with hot, red water! That is why there’s a red devil on the box… Let’s get back to the bath salts: this one produces a clear, light green color and has a fresh scent that reminded me of cypress or a wood fragrance.. Rating: 4/5 (just because I prefer the milky ones). 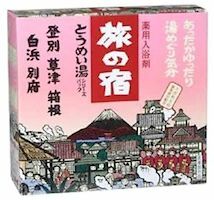 Hakone is in Kanagawa Prefecture. It has been one of Japan’s most popular hot spring resorts for centuries, and is the closest hot spring area to Tokyo and Mt. Fuji. Green sachet, and green water, with the fragrance of fresh herbs (according to the box, but I smelled pine tree…). 3/3. It is a city in Iburi Subprefecture, Hokkaido, the Northern island of Japan. Part of the Shikotsu-Toya National Park, it is southwest of Sapporo. Water is quite yellow, reminded me of light beer, but the box says mustard. It has a flower fragrance with a nice sulfury-hotspringy tone. 4/5. Kusatsu Onsen is a hot spring resort located in Gunma Prefecture, northwest of Tokyo. It is a popular tourist destination. The source of its hot water is nearby Mount Kusatsu-Shirane. Makes the water very bright yellow with a hint of green and has a nice citrus / lemon smell. 4/5.